Your very first Christmas with baby is extremely precious. Even though they may not remember it, babies absolutely love the shiny lights, Christmas tree and the jolly festive songs. It’s a time you can also create long-lasting traditions and gaze in wonder at this little bundle of joy you’ve created. However, despite how magical it can be, Christmas with a new baby can also be extremely stressful. If you get stressed, baby is going to get stressed and that’s enough to completely ruin the big day! 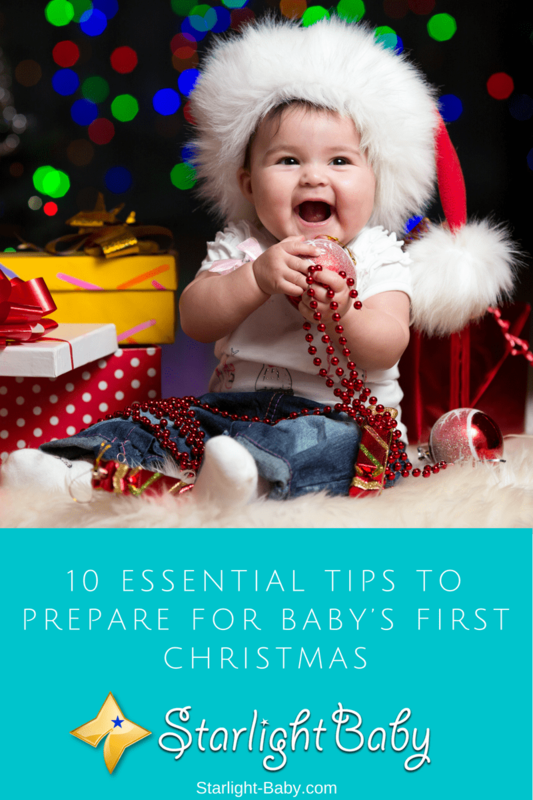 So, if you want to make sure your first Christmas together is a magical, relaxing one, below you’ll discover 10 essential tips to prepare for baby’s first Christmas. Travelling with a baby at Christmas can be extremely stressful. It’s not just the trip which can be a nightmare; it can also really wreak havoc on your baby’s schedule. So, rather than agreeing to go to friends or family’s houses, it would be much more sensible and less stressful to invite people over to yours. Now, that doesn’t mean you need to do all of the cooking. Why not make it a potluck Christmas where guests bring a specific part of the meal? So, you could be in charge of the meat, somebody else could be in charge of the vegetables and so on. That way, you won’t be stressing out trying to cook a huge dinner while also attending to baby’s needs. It may be Christmas, but that doesn’t mean you should deviate from your little one’s routine. Doing so can lead to major meltdowns and trouble for weeks to come! So, try to keep to baby’s existing schedule for feeds, naps and bedtime. Remember, if you’re having lots of visitors, your little one is likely to need more naps than usual as it can become exhausting dealing with lots of people! If you can stick to baby’s routine, you’ll find their first Christmas a lot more relaxing! Following on from tip #1 – don’t try to be supermom! Now that baby’s here, it’s going to be much more difficult to get things done on the big day. So, as well as getting help cooking the dinner, you’ll want to minimize your chores for the day. If need be, clean up and sort everything out in the week leading up to Christmas. Then, all that’s left to do on Christmas Day is relax and enjoy the day. If you’ve still got the dreaded “baby brain” it’s likely you’ll forget somebody’s Christmas card. So, keep a stock of cards and stamps by the door. That way, if you get one from somebody you’ve forgotten, you can quickly write one out, get a stamp on it and post it next time you leave the house. Baby’s first Christmas wouldn’t be complete without a cute little outfit. However, you need to keep in mind that it’s unlikely baby will be happy to stay in the outfit all day. They could become too hot, or the feel of the costume may irritate their sensitive skin. Rather than an actual outfit, why not consider investing in a Christmas themed playsuit? Baby won’t get too hot and they’ll still be dressed for the occasion. Santa may be a lovable, friendly guy to you, but for baby he can be pretty terrifying. So, if you’re thinking of taking baby to visit Santa this Christmas, be prepared for potential meltdowns! All babies are different, and some may be mesmerized by Santa, while others may be really frightened. If you know your baby is uncomfortable around strangers, it may be best to skip seeing Santa this year and wait until they’re a little older. For whatever reason, illness always seems to strike at the worst possible times. Babies are prone to picking up colds and mild illnesses, especially in winter. So, don’t be surprised if you wake up on Christmas morning and your little one isn’t feeling their best! It may not be the way you imagined spending Christmas, but just remember baby can still enjoy some things even if they’re poorly. Stock up on baby-friendly medicine and prepare for plenty of rest and TLC just in case. Of course, you’re going to want to spoil baby for their first Christmas, but the truth is, they’re too young to appreciate most things at this stage. Many parents are dismayed to find their baby prefers the box a present came in, rather than the present itself! While a few new toys will definitely be appreciated, your little one is most likely to enjoy the twinkling lights, tree and Christmas music. So, don’t spend too much on your baby this Christmas. Buy a few things, maybe something practical like a new outfit, and wait until they’re a little older to splurge on gifts. Before you brought baby home, you likely spent hours making sure it was baby proof. However, it’s easy to forget to do the same when you’re putting up the Christmas decorations. One of the first things you should do is make sure the tree is firmly anchored to the wall. That way, there’s no chance it could fall and topple onto baby. If you have glass or breakable Christmas ornaments, these should also be kept well out of baby’s reach. Finally, it’s a good idea to make sure your expectations are realistic. It’s common for new parents to envisage a perfect, joyful day where nothing at all goes wrong. This may well happen, but the chances are pretty slim! You can’t predict anything with babies. As mentioned earlier, they could be poorly on the big day, and things won’t necessarily go to plan. You also may not be able to do everything you think you can do. So, adjust your expectations, or better still, don’t have any! That way, you won’t feel disappointed or stressed if things don’t go to plan. These are 10 of the best tips to prepare for baby’s first Christmas. Above all else, don’t forget to enjoy the day. The baby stage passes so quickly so be sure to take plenty of photos and maybe even look into creating your own festive traditions. When it was my baby’s first Christmas, I remembered it’s such an exciting thing to buy a Christmas attire for the baby. But since I know my baby will fuzz over something that’s too warm or not his usual attire, what I did is dress him up earlier for a pictorial and have it printed on large format to become our Christmas decoration in the house. So when Christmas arrived, when families come and visit, he doesn’t have to be in the Christmas clothes that will make him uncomfortable but family and friends can see him in one, posted in our house all over. First holidays shouldn’t be something that will make the baby uncomfortable but it should just be comfortably memorable for them. That sounds like a really great idea! Thank you for sharing, @AmieBotella. You’re right about making the baby comfortable with what he’s wearing on Christmas. With all the things happening around him on Christmas, it would help a lot to have him wear something comfortable so as not to irritate him further all through the night/day when loved ones come for a visit. Amazing tips on how to celebrate the first Christmas with our babies when they are having such experience for the first time. One thing about not travelling is that it is going to give the parents the time to have a peaceful celebration and not what we experience with change in weather and environment. In as much as I was that strong, as a baby, to celebrate my first Christmas in our village then, I still think it’s safer to not travel in order to reduce chances of health issues. A peaceful Christmas celebration with your closest family members sounds good 🙂 With all the hectic lifestyle most people lead these days, they would look forward to a little peace and quiet. Staying indoors would be wise too if it gets too cold outside. I’m of the introvert type and enjoy having quiet and peaceful time with my family which is the reason that will be the best way to celebrate the festive season with my loved ones.